Parental Ideas: Revs fans, get your #ScarvesUp for Scarftember! 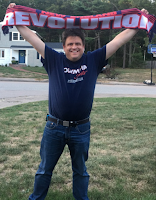 Revs fans, get your #ScarvesUp for Scarftember! Hey Revs fans! This one's for you! September is Childhood Cancer Awareness month, and the New England Revolution and Major League Soccer are helping to “Kick Childhood Cancer” with their month-long initiative. Every sports team has their signature piece of sports memorabilia, and for soccer fans it’s their scarves, so get your #ScarvesUp during “Scarftember” to help raise money for the Children’s Oncology Group for childhood cancer research. For every post on Twitter and Instagram using #ScarvesUp with a photo of any Revs scarf (or other MLS team) in the month of September, Major League Soccer will donate $1 to the Children’s Oncology Group, and one post will win a $250 gift card to MLSstore.com! NOTE: I received a Revs scarf to take a photo with for Scarftember. No other compensation was provided.